Dogs and their owners have a new place in Calgary to have fun and meet other fellow dog lovers near the University of Calgary. The two-acre space opened for the first time on Sunday morning right near the massive housing development that’s expected to open over the new few years. The dog park is fitted with artificial turf to cut down on standing water and maintain durability in high traffic areas. It is also part of a larger, 40 acre park for the community that will be connected by a 12 km path system. Officials estimate that 65 percent of the people living in the University District will have pets and will want to have a place for them to burn off some energy. James Robertson, president of West Campus Development Trust, says University District was envisioned to fit with all Calgarians. Robertson says that it’s also more than just a place to let your dog exercise; it’s also a place to get to know your neighbours. The dog park has two sections, a larger one for bigger breeds and another for smaller breeds. 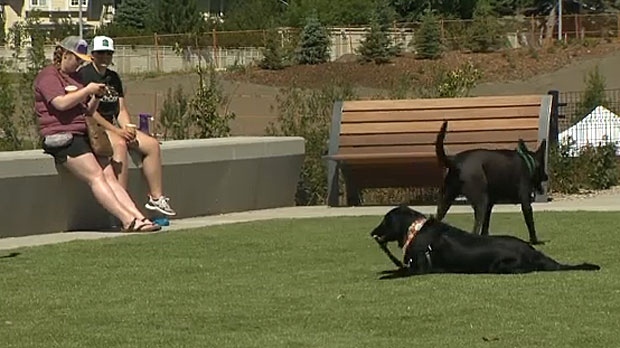 The University District says that 65 percent of the residents of the community will have dogs and that's why it built a dog park for them.